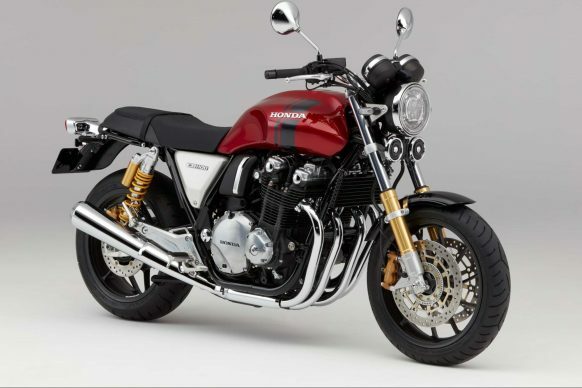 Would You Buy A 2018 CB1100 RS? We picked up one of the new CB1100 EXs from Honda last week, and so far we’re impressed with its higher level of finish and new suspension with better control. Stay tuned for our review of the $12,199 retro machine in the coming weeks. And that made us think back to when the EX was announced at Intermot last autumn, and we were reminded about the sportier RS version that is available in other markets (visible at the top of this page). It features radial 4-piston brake calipers mounted to a beefier fork and also remote-reservoir shocks out back, along with cast aluminum wheels replacing the wire-spokers on the EX. It retails in England for 11,139 Pounds, which is only 374 Pounds more than the EX. That’s about $500 USD. 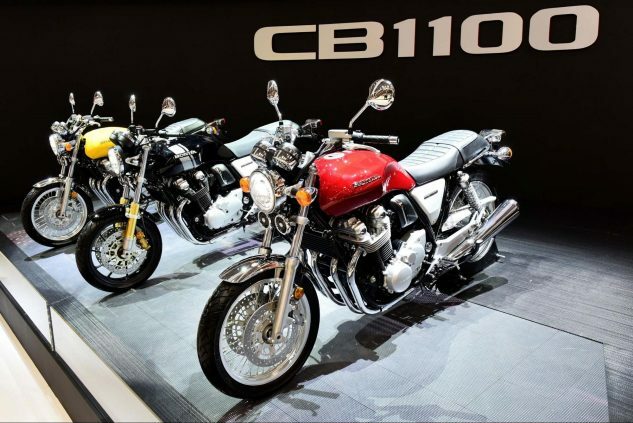 The CB1100 RS in black is sandwiched between two EXs. The red bike in the foreground is an EX identical to the one we’re currently testing. So, the question American Honda must be asking is how many prospective RS owners are out there on our continent. On the one hand, the RS retains the same docile air-cooled inline-Four 1140cc powerplant as the EX (about 84 rwhp), so it won’t offer increased acceleration performance. On the other hand, a $500 premium that nets better suspension and brakes seems like a bargain. What do you think? Is the CB1100 RS a bike you’d consider parking in your garage for an MSRP approaching $13k?